Movember. Hipster beards. That game where you put a moustache on the TV and drink when it lines up with a character. Moustaches on everything. 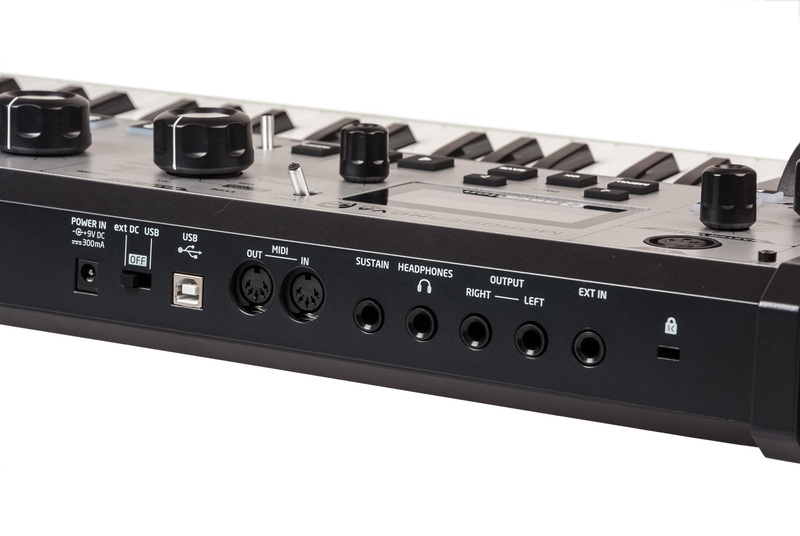 What is the Novation MiniNova? With roots going back to the EDP Wasp and Oxford Synthesizer Company OSCar, Novation have consistently produced affordable, punchy instruments with a unique character. Their flagship SuperNova was one of the most ambitious virtual analogue synthesizers, and soon defined the evolution of mainstream techno, dance and trance thanks to a greater depth of control and expression than many contemporaries. Unlike some manufacturers, Novation has allowed new technology to make their Nova architecture increasingly affordable. Two extremely popular and affordable compact synths, UltraNova and MiniNova, have brought the SuperNova feel to a new generation since 2010 and 2012 respectively. Nevertheless, with recent releases focusing more on control of software than synthesis, the UltraNova and MiniNova’s improvements over the original “Nova” architecture have reached most of the musicians they’re going to get to. The UltraNova is just under £400, the MiniNova a little over £300, and used values remain strong; keeping the system fresh and marketable needs something to stand out. That something was announced in May 2015. A slightly patchy reception, with comments questioning the validity of a whole limited edition to package some signature sounds, suggests that synth players may not assign much weight to celebrity endorsements – unlike the guitar market where dressed-up low-end models can still command strong prices by aping the preferred style of famous players. 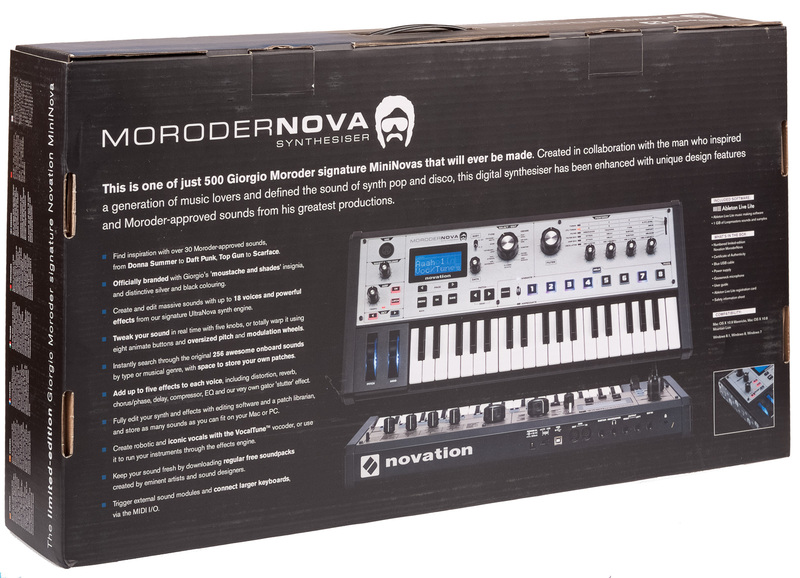 Still, Novation handled their collaboration well – the MoroderNova not only identifies with an undeniable legend of electronic music, it comes in at the same RRP as the regular model’s launch price (typically, around £50 extra on the street price). American retailers like Sweetwater are seemingly offering the same sort of discounts a regular MiniNova would attract, too. Limited to 500 units worldwide, 50 for the UK, and 5 for my preferred music retailer PMT (part of Dolphin, so I do wonder if Dolphin also had five), the pre-order announcement from Novation’s mailing list hit a couple of days after the links from most retailers inviting pre-orders – as such, I’d got an order in and saw the stock status change to “Unavailable” later in the day. Already a fan of Moroder for many things, not least Electric Dreams and the reworked Metropolis, the secondhand MiniNova I bought in 2014 had got me back into enjoying making music again and the idea of owning a homage to a musical hero with the confidence that I already liked the core product was irresistible. Getting the MoroderNova – number five is alive! 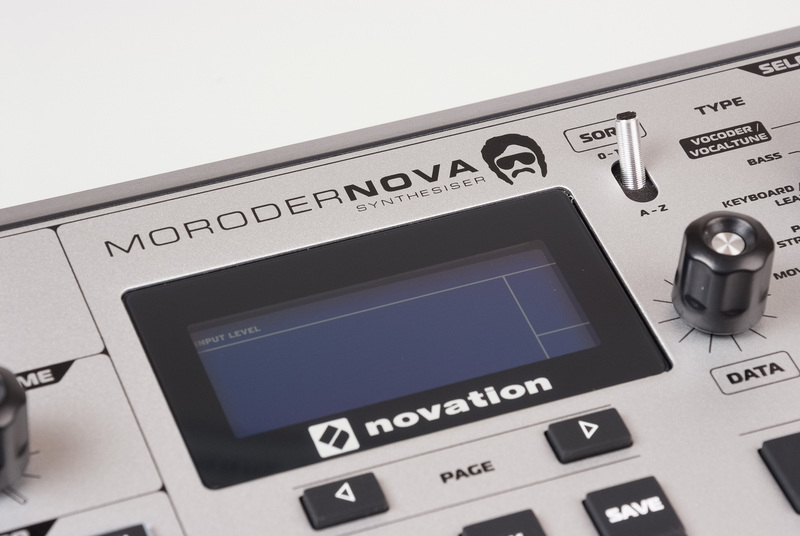 Differences between the MoroderNova and MiniNova are trivial in synth terms. 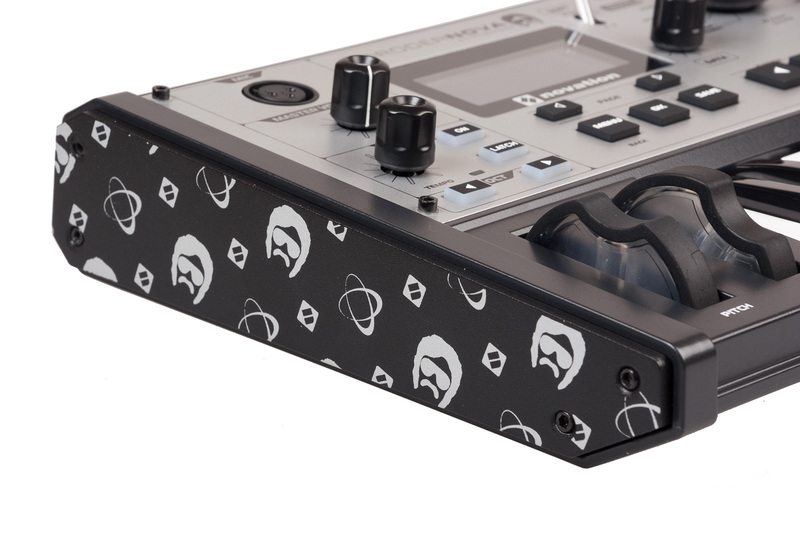 The faceplate is silver with black graphics (some may remember the limited edition SuperNova keyboards) rather than the blue/black scheme traditional for Novation, and there are moustache and sunglasses details liberally applied. The default patch set has been partially replaced with a set of patches either programmed by Giorgio Moroder, or programmed to match signature sounds he used throughout his career – it’s unclear, though in recent videos he is seen playing the minikey synth. The limited edition nature comes down to a certificate of authenticity – and perhaps, if people don’t do the inevitable and share the patches, some unique sounds. 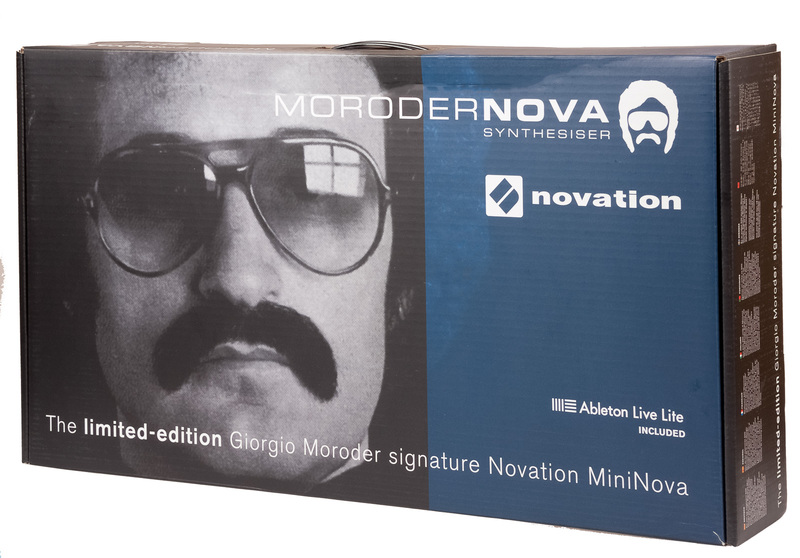 It seems pretty unlikely that the large community of MiniNova owners will somehow be prevented from getting the Moroder set, so Novation should probably release them as part of the library when the limited edition synths have sold out. Mine is number 005 – surprisingly, the only indication of this is the serial number and certificate rather than a limited edition number in a more visible location. You may think that I just advocated giving up something that makes my new synth “valuable”, but really, I doubt many people have snapped up one of these because it’s going to have some future sales potential. It’s a bit of fun, a bit silly – the graphics tell you that this is no po-faced attempt at lending handcrafted/magical musical mojo to a mass-produced product, it’s no tolex-wrapped Moog or 5150 Kramer. 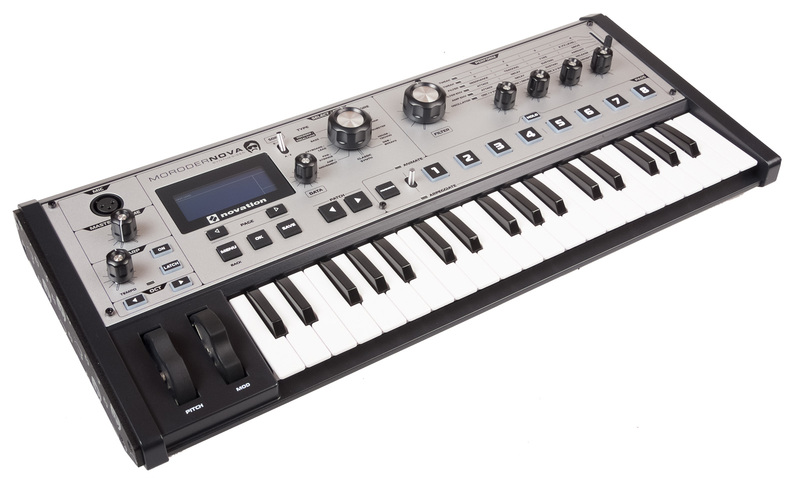 If there’s any criticism I would want to make, it’s that it doesn’t quite go far enough in the silliness – Korg have done well with reverse/red & black keys on past models, and reverse keys on the MoroderNova would have enhanced the limited nature and visibility of it (as well as complementing the silver monochromatic feel). And what of the synth itself? It’s a MiniNova, pure and simple, so there’s nothing different about the sound or controls. The minikey keyboard is still a compromise, with no aftertouch, though once you get away from the snobbery of having professional, piano-sized keys the advantages in span and speed the smaller keys present can be turned into an advantage. The USB port is for MIDI capabilities, with no audio interface unlike the UltraNova, and the audio input and microphone are unchanged. This is a good thing, as the MiniNova is still one of the best “cheap” synths going. Used models in good condition can be found for as little as £180, and even new they are often found for £250, or bundled with accessories that theoretically make them that cheap. The 18-voice architecture has 3 oscillators per voice, 66 potential modulation destinations, with 20 sources per patch chosen from 6 envelope generators, 3 LFOs and the usual selection of MIDI sources. Aftertouch is supported, even though the keys cannot provide it. Each patch can be built from a selection of standard waveforms, digital waveforms and wavetables – and then, fed through up to five effects. The specification is derived from the SuperNova II, but loses the comb filter and FM capability – the latter is covered by the 20 digital waveforms. The small reduction in polyphony does not reflect a weak engine in the MiniNova though, you can make dense patches and still have plenty of notes remaining. An impressive sound creation tool can be found in the “Density” and “Density Detune” controls, which create up to 8 virtual oscillators without much impact on polyphony. 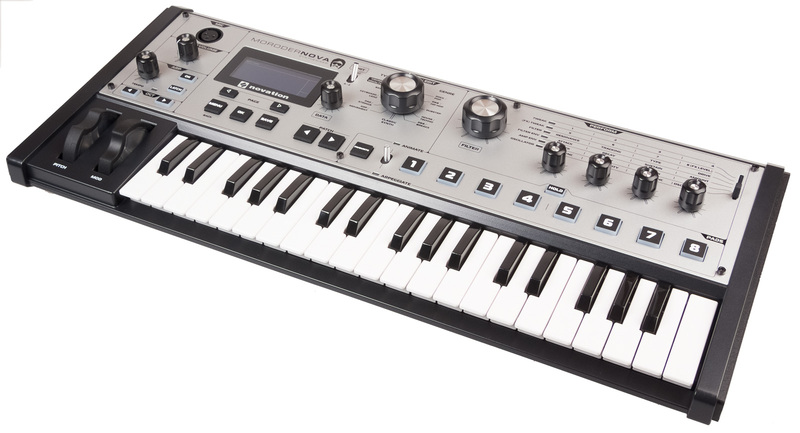 Given the low price, you could be forgiven for thinking the MiniNova sits behind even Novation’s earlier entry level keyboards – the underrated X-Station, KS/K-Station. Some of the standard patches are inevitably aimed at shop-demo impact for sure. To assume that’s all it will do is incorrect, though. An immense palette is available and the animation control, arpeggiator and complex envelope and LFO matrix allow the MiniNova to produce virtual analogue soundscapes of immense complexity and subtlety. 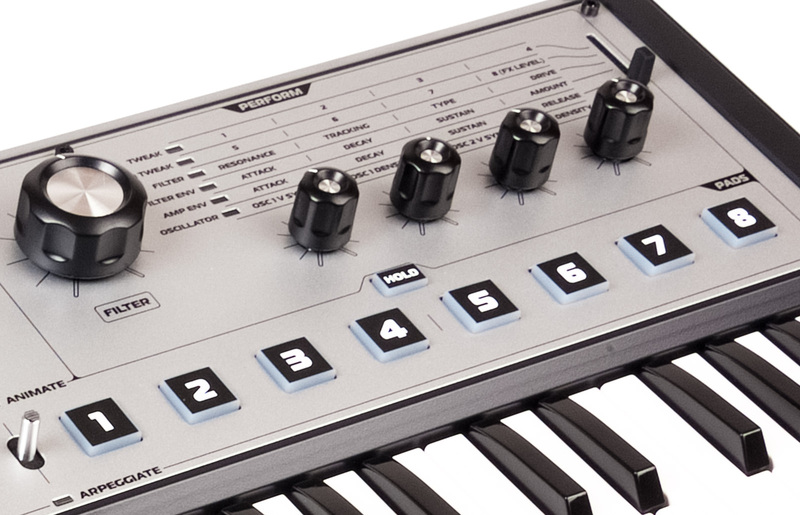 It may be small, but this synth could step into the armoury of Vangelis or Hans Zimmer producing a classic Sci-Fi soundtrack with no sweat at all. For a stripped out interface, it manages to be quite intuitive too. The eye – and hand – are drawn to the immense filter control knob. Well weighted this gives great control with more precision than a typical rotary encoder or pot, and greater repeatability than a fader. It also feels good to use. Users of Waldorf’s synths and machines like the Use Audio Plugiator will find the matrix access to controls very familiar – a switch selects from rows of controls, with individual encoders. The controls “pick up” where the patch is set, and a memory indicator in the LCD tells you when you’ve returned to the original value. This layout suits performance tweaking more than patch creation, where the included MiniNova Editor and Librarian packages offer a better workflow. The gooseneck microphone, which seems to have become a requirement for any compact virtual analogue since Quasimidi’s brief moment of glory, feeds into a rather impressive Vocoder. Novation have recognised the adoption of pitch correction throughout the industry, and alongside the traditional vocoder patches (yes, it can do all the obvious ones) a Vocal Tune capability allows the singer to control pitch with the keyboard, live. Cher’s “Life after Love” can be a reality for buskers everywhere. For sheer accessibility the MiniNova’s vocoder makes it more appealing than some standalone options where MIDI control from an external keyboard is required, and for quick & dirty vocal tweaks it’s a lot easier than trying to set up scales in an ATR/AVP or VoiceWorks. Access to the filters is also possible – a 1/4″ audio input on the back panel can either feed the vocoder, provide a dry mono mix just to save on plugs, or be fed through the effects and synth engine. The XLR socket on top is intended for a dynamic microphone, and the one provided is sensitive enough. With a USB port for MIDI, the MiniNova can be used to control DAWs. Novation have good form here, with the X-Station really pre-empting the soft of integration that is now commonplace. Ableton Live Lite is included with the MoroderNova and MiniNova, and whilst downloading extras, the librarian makes it very easy to deploy the library of free sounds on the website. All of these things apply to the MoroderNova. You’ve made it this far and probably forgot that’s what this review is about. All that changes are those patches. They’re good. I particularly liked “BreathBass”, which is the distinctive bassline that drives Berlin’s “Take My Breath Away”. It’s inevitable that the few music stores that have a MoroderNova in stock and on display will get very tired of that intro very quickly. As launching points for some solid dance, disco or electronica, the Moroder patches replace some MiniNova presets I really didn’t miss. It appears the patches are write protected and Novation have stated on the forum that there are no plans to reveal the patch set outside of the MorderNova, but it does feel like there could be more in there. Soundtrack landmarks, like Top Gun, Flashdance and Scarface do have the limitation that if you want to use them, comparisons will be drawn with the original track. The whole feel of each patch is retained, so it’s not the situation of “this is the basic patch used” without the post-production effects; a benefit of the Nova architecture’s effects chain. With an impressive career spanning five decades and multiple styles, it would have been good to have some genre-crossing material from Moroder, and it’s also telling that two of his highest profile works from the ’80s are skipped – Electric Dreams, from which the eponymous song got significant airplay and a good lead and bell percussion could be curated, and anything from his restoration and remix of Metropolis, which offers great classic ’80s potential in Rotwang’s Chase, The M Machine and Cage of Freedom. Ultimately the MoroderNova’s limited release also limits the relevance of this review, except – patches aside, the MiniNova is the same thing. 5 years after the UltraNova launched, the sound engine still has little to match it on the market, and it stands alone at the price. Moroder’s retro credibility might help a relatively young company get in on the rose-tinted glasses fuelled revival – like Korg’s RK keytar and virtual Rolands. It’s simply not necessary. When the obvious firms get in on the act, you get less than you hoped for – just look to Yamaha’s “Reface” revival models, where the scaled-down DX7 is a four FM operator engine, not the 6Op FM of the original. Novation has delivered more, for less, consistently since 1992 and it could be argued they don’t need a gimmick to sell synths. In the future, I’d hope to see Chris Huggett’s talents turn again to something to rival the SuperNova II’s build and keyboard. The leading position of the 48-voice, multi-timbral, multi-effect system has been eclipsed (though, it took a while) and yet the 18-voice capability of the Ultra and Mini would surely be scalable to get back into the 61-key, multi-timbral workstation market. Technology and user interfaces have evolved, and what Novation could accomplish with a flagship synth would be very intriguing. Similarly an amount of attention paid to the classic OSCar has led to speculation of a re-release – and yet, the iconic machine there is the EDP Wasp, a unit that would suit recreation as a light, self-contained synth with modern quality components for the membrane keyboard and simple case. Recreations of the Wasp have commanded high figures, and the original is exceedingly collectible. ← Avantime Tips: Rev Counter Bulbs!